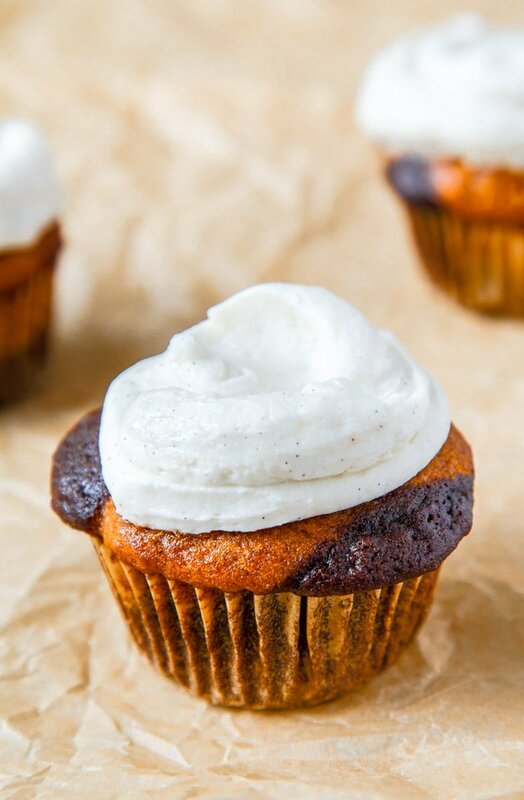 Chocolate Pumpkin Cupcakes with Vanilla Bean Buttercream. Cupcakes are approximately so many years out-dated they’re cool again, yes? I need a vehicle for fat dollops of vanilla bean buttercream, and have an open can of pumpkin in the fridge. So, we’re making chocolate pumpkin cupcakes today. 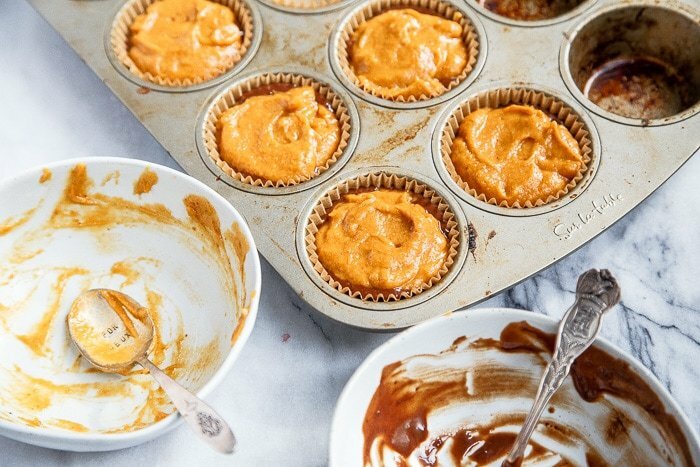 In my expert opinion, if you leave off the vanilla bean buttercream, you can absolutely call these chocolate pumpkin muffins and enjoy them for breakfast. I use the ‘best chocolate cupcake ‘recipe from my book, and my recipe for pumpkin chai cupcakes to swirl together to make these pretties. I change the amount of leavening agents ever-so-slightly, so don’t swirl the original recipes together and expect bakery-style cupcakes. After attempting that on my first trial, I can tell you that it won’t work. I still ate the results, of course, but you don’t want cupcakes that wildly spill over the tops of the muffin cup and stick to the pan, right? Didn’t think so. While my swirl technique leaves a lot to be desired, the flavor of these cupcakes do not. It’s incredible how well the spiced pumpkin batter goes with the dark chocolate. Chocolate likes spice; this we’ve known for quite some time. So, if your mind (and stomach) is a little over the pumpkin spice-everything food group this time of year, try pumpkin and chocolate! Pumpkin is a vegetable, after all, so we’re required to eat it. It’s not our fault if it tastes best with brown sugar and vanilla bean buttercream. I should mention this recipe make 6 cupcakes. My standard cupcake recipes make just 4, but when these two batters are combined, it makes a few more cupcakes. We can’t complain about two extra cupcakes now, can we? We just eat them. Have you noticed you can’t take a bit into a cupcake without smiling? One final note: you’ll be using the whole egg in the recipe, though it will be divided between the two batters. The chocolate batter gets the yolk; the pumpkin batter gets the white. But if you’re ever left with extra egg whites or yolks, I have a handy guide for using up leftover eggs. If you love pumpkin-swirled desserts, try my Pumpkin Nutella Muffins and my Pumpkin Swirled Brownies. First, make the chocolate batter: whisk together the flour, cocoa powder, baking soda and espresso powder. Set aside. Whisk together the oil, vanilla, brown sugar, buttermilk, and egg yolk. Set aside. Next, make the pumpkin spice batter: whisk together the flour, baking powder, baking soda, salt, and spices. Set aside. Whisk together the egg white, pumpkin, brown sugar, oil, and granulated sugar. Set aside. When ready to fill the pan, mix the dry ingredients for the chocolate cupcakes into its wet ingredients. 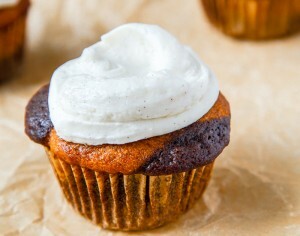 Then, mix the dry ingredients for the pumpkin cupcakes into its wet ingredients. You have two separate batters. Layer the batters in the cupcake liners, swirling if you like. I did a layer of chocolate on the bottom, followed by pumpkin, chocolate, and finally pumpkin. I didn't swirl the batter together for the cupcakes you see in the photos--the baking soda in the chocolate batter will make it rise up around the slightly denser pumpkin batter. Lovely! Bake the cupcakes for 17-20 minutes, or until a toothpick inserted comes out with only moist crumbs. Let the cupcakes cool in the pan for 1 minute, and then move to a cooling rack to cool completely. To make the frosting: beat the butter until light and fluffy, about 1-2 minutes. Slowly add the powdered sugar, vanilla bean, vanilla extract, and salt while continuously beating. Add the heavy cream, starting with just 1 tablespoon of the cream, and add more if needed to make the perfect frosting consistency. 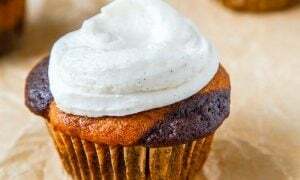 Frost the cupcakes with the vanilla bean frosting, and serve. These cupcakes are GENIUS!!! The pumpkin, chocolate and all those fragrant spices have me drooling! Love the pretty contrast between the chocolate and pumpkin. And yes, cupcakes are ALWAYS cool! Pumpkin and chocolate! Yummy! These cupcakes look great! Yum! These cupcakes look delicious and the vanilla bean buttercream sounds divine! i love how this only makes 6 – perfect two hungry people! Chocolate and pumpkin are a match made in heaven. And with a little dollop of the vanilla buttercream and I bet these are just perfect! Mmm those look delicious! Love that vanilla bean buttercream with the pretty flecks of vanilla caviar–I imagine it goes perfectly with the pumpkin + chocolate cake! I love the pretty swirl going on in these cupcakes. I made these last night….. and all I can say is that I’ll be making them AGAIN and AGAIN and AGAIN. They’re perfect!!! My husband and I, shockingly, liked them without frosting almost more than with the frosting! Can I skip the espresso powder?